I used to dream of having a bigger house, and now I dream of a cheap room to rent. I used to dream of taking a relaxing vacation, and now I wish I could simply be reunited with my children and family. I used to have my own business, and now I pointlessly look for a job. I used to dream of the future, and now I yearn for one day of the past. I used to dream of having a stable life, and now I dream of having a stable death as there are not enough graves for us. Before it was a Palestinian refugee camp, Al-Yarmuk was long known as the battle that consolidated Syria under Arab rule after the landmark defeat of the Byzantine Empire in 636 CE. From now on, however, it will be remembered as a site of disintegration where one of the longest and tightest sieges in the course of the Syrian uprising-turned civil war is taking place – a siege that has so far seen some 160,000 of its Palestinian residents flee and the remaining 17,000-20,000 face starvation or death from illness or injury. Al-Yarmuk now stands between Tel al-Za’tar – the Palestinian refugee camp in Beirut besieged and then assaulted by Syrian-backed, right-wing Lebanese militias in 1976 – and the next barrel bomb attack on Palestinian communities in Syria. 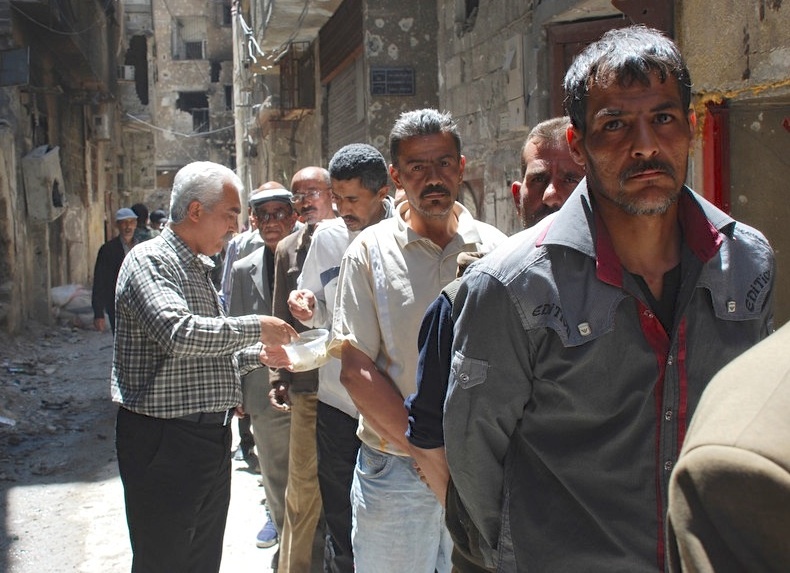 Indeed, since the first week of July 2013, Al-Yarmuk residents have not had access to the basic necessities of life. Anyone who attempts to break the siege is usually gunned down. Those who are wounded are left to die because they are not allowed to exit the camp to receive critical medical treatment. Conservative estimates reveal that at least 194 civilians have lost their lives, 128 of whom, babies and the elderly among them, have starved to death under catastrophic conditions. Many residents have been arrested, tortured, and subjected to forced disappearance by Syrian military forces and other pro-government groups, like the Popular Front for the Liberation of Palestine-General Command (PFLP-GC). Reduced to scavenging in desperation to stay alive, Al-Yarmuk residents have turned to boiling grass and eating cat and dog meat as a final resort while awaiting the increasingly Oslo-esque elusive settlement between representatives of the Syrian government and opposition forces. In both cases, the regime, at that time desperate to gain traction in the growing uprising against it, encouraged the demonstrations and facilitated access to the border by removing checkpoints and even providing transportation to the border on Naksa Day. Yet, at their time of greatest need, when the Israeli military unleashed lethal firepower against the unarmed protestors, killing 26 of them, the Syrian authorities and the Palestinian factions that promoted the demonstrations were nowhere to be found. Activists also hold the regime responsible for the aerial bombardment and systematic destruction of large areas of their camp, which resulted in a number of civilian deaths in December of 2012. Neither do they absolve certain Free Syrian Army (FSA) factions, who forcibly entered the camp following the bombardment and proceeded to seize private homes and hospitals and abuse the residents. From day one, FSA fighters showed almost complete disregard for the authority structures of Al-Yarmuk, and, in particular, showed no deference for its carefully calculated position. Anger was also directed at the Palestine Liberation Organization (PLO)/Palestinian Authority (PA) for not doing enough to support the residents of Al-Yarmuk, who faced daily shelling and rapidly diminishing food and medical supplies, all signs of the impending siege. These feelings were exacerbated by the news that the PLO/PA’s efforts to negotiate a settlement between government and opposition forces reportedly displayed more concern over the fate of Assad than besieged Palestinians, thus outweighing its efforts to lift the siege or assuage the suffering of those Syrian Palestinians unable to obtain travel visas to countries where the PA has diplomatic representation. When a Syrian gave Palestinians the name for the most traumatic cataclysm in their modern history – Al-Nakba – it was an act of rational empathetic contemplation. Today, the Syrian nakba has dictated the painful acknowledgement of several conceptual causalities that can be added to the colossal human loss. During the long Ba’ath years, when Syria “championed” the Palestinian cause, Palestinian Syrians were never allowed to be fully Palestinian – nor fully Syrian. While the state made efforts early on to integrate most Palestinians into Syrian society by offering them many of the same rights as Syrian nationals, except citizenship and the right to vote, this much-touted policy overlooked two facts: first, many other Palestinians who entered Syria after the first wave, which occurred between 1948 and 1956, remained largely right-less; and second, the totalitarian nature and structure of the society into which the rest of the Palestinians were integrated. Only those Palestinians who fled to Syria in or before 1956 and their descendants were integrated into Syria’s legal and socioeconomic frameworks. But a significant number of Palestinians fled to Syria after 1956 as a result of further conflict. The Syrian state habitually ignores this group in analyses that seek to promote its integration narrative. Those who fled to Syria during the 1967 war with Israel, from Jordan after the 1970-1971 events of Black September, from Lebanon after the 1982 Israeli invasion, and from Iraq between 2006-2008 all lack most of the basic rights that are extended to other Syrian Palestinians, such as the right to remain as permanent residents and the right to work without being required to obtain residence and work permits respectively. The last group – Palestinians from Iraq – was denied entry into Syria and remained in the Al-Hol desert refugee camp close to the Syrian-Iraqi border for years before countries as far as Brazil offered to resettle them. It is noteworthy that all these policies were adopted during the Ba’ath years, unlike the earlier, more generous ones implemented in 1956. Indeed, Palestinians who fled to Syria in or before 1956 were more fully integrated than those who came later, but this group was integrated into a totalitarian system that prevented by force any meaningful right to free political expression for the entire population. It managed to keep self-determination at bay through the combination of a ruthless security apparatus and economic policies securing minimum living standards for the ruled population – an economic and security policy not entirely dissimilar to the PA’s in the West Bank and Gaza. Full integration, therefore, has equaled full cooptation and – as in most other Arab countries with Palestinian refugee populations – the systemic subversion of the emergence of strong institutional expressions of a distinct Palestinian national identity, no different, in fact, to the regime’s treatment of its own Syrian nationals. As a result, Syrian Palestinians were not free to express belonging to either Syria or Palestine beyond the regime-sanctioned mimetic rehearsals of pan-Arab sloganeerism. The Syrian model is often compared with Lebanon’s inhumane treatment of its Palestinian population. 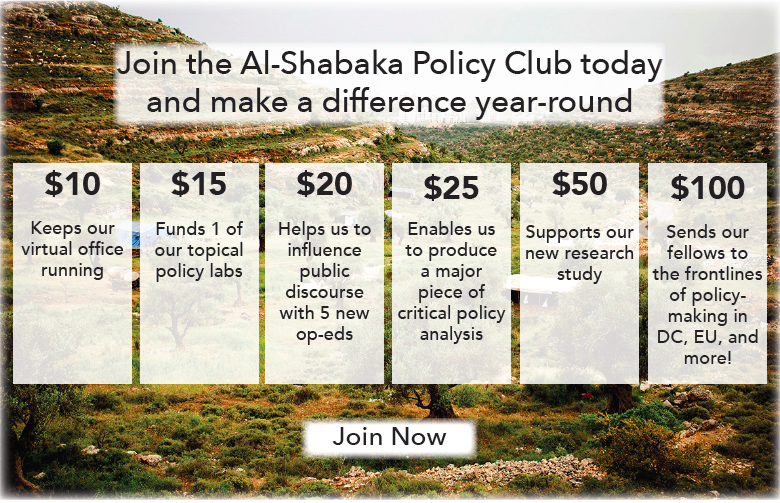 But what such comparisons fail to account for is the level of political and institutional autonomy available to Palestinians in Lebanon that result, costly and unintended as it might be, from an inverse policy of ostracization and persecution. One of the accomplishments of the Syrian uprising, however, is that it has extended the right to return to politics for all those in Syria, including Palestinians. Shared suffering at the hand of violence has led to the realization of both Palestinian and Syrian ideals and identities away from the rhetoric of the regime. The scenes of a fellow demonstrator dying, the news of a close friend perishing in the siege, the blood-stained cloth of a neighbor who is being treated in a makeshift field clinic, all constitute ritualistic returns to communal political engagement. The siege of Al-Yarmuk has unearthed trans-generational memories of the first Palestinian Nakba, kept alive by the obduracy of second- and third-generation refugees now witnessing, without narration or mediation, their camps – their neighborhoods – disappear like those of their grandparents. Concurrently, the urgent need to help neighbors and protect their city centers has instilled a new sense of attachment to Syria as a site of lived memories previously nearing extinction. Thus, a new paradox has been introduced: at precisely the moment that many Syrian Palestinians felt most attached and committed to the uprising as Syrians, their commitment was harshly and abruptly trampled on by the FSA factions operating in the regions around and later inside the camp. The options available to Syrian Palestinians who are being made refugees yet again hover between the tragic and the absurd. Two propositions sum up the unbearable paradox of being twice displaced. As the siege and resulting mass displacement continue, former Yarmuk residents have started a unique call demanding the right to return to and from the camp – a return to the safe familiarity of the protracted camp, from the fragile makeshift shelters that they found outside the camp, and a return from the protracted camp to the cities and villages in the Galilee from where they hail. The latter return – the only just solution for Palestinian refugees everywhere – has been made even more urgent given that more than half of the 500,000 Syrian Palestinians have been displaced, many for multiple times. Furthermore, the places to which they flee within Syria are becoming more and more dangerous. Even the relatively stable places that have so far been saved from the brunt of the bombardment are increasingly becoming unsafe while being pushed to take unequivocally pro-regime stands. Outside of Syria too, relative safety comes at extraordinary human cost. Almost all of the countries that are currently accepting refugees fleeing the Syrian conflict welcome Syrian nationals as the “good” refugees and close their borders to Syrian Palestinians who are treated as the perennial “bad” refugees. The Lebanese government previously permitted entry to nearly 53,000 Palestinians displaced from Syria who now reside in already over-crowded and under-serviced camps of fellow Palestinians, is now turning them away at the border, while deporting others. Jordan, meanwhile, has been denying entry to Syrian Palestinians since early 2013. Those who managed to enter before that time, numbering almost 14,000, have been given a status different to that of other refugees fleeing the conflict in Syria. While the vast majority live with host families or in rental properties, according to UNRWA, a few hundred have been corralled into Palestinian-only camps, like Cyber City, where they are reportedly prevented from leaving. All live in extremely poor conditions. Syrian Palestinians have also fled to Egypt, Libya, Gaza, Turkey, and as far as Southeast Asia. The ebb and flow of the horrors at home in Syria and Arab governments’ neglect and maltreatment of Palestinian refugees abroad has pushed many to the last frontier, both in a figurative and literal sense. Even before the recent fall of Homs, obituaries of the Syrian uprising started to appear in Arab dailies, while a more sober analysis paints a melancholy picture of the fate of the current conflict. Amidst the fragmentation and lack of coherence of the opposition forces inside and outside of Syria, the regime is likely to consolidate its power over significant parts of the country and de facto jettison the rest. Under such a scenario, most Palestinians in Syria would end up in regime-held areas. Forced to choose between a Yarmuk-style starvation and siege and a fragmented, weakening, and negligent opposition, ordinary Palestinians are already caving in to the regime as reflected in pro-government marches and the dissemination of propaganda. While survivalist at its core, this is a major setback for the revolutionary potential that was seen earlier in the uprising with Syrian Palestinian martyr Ahmad Kousa, one of many Palestinian community organizers and activists who sided with the Syrian uprising and coordinated with Syrian activists from Al-Yarmuk. Like their parents in Beirut 1982 and grandparents in Jaffa in 1948, Palestinians today find themselves literally being pushed into the sea. Ultimately as a result of Israel’s denial of the right of return for Syrian Palestinians – the majority of whom hail from Galilean towns and cities just several hours away – as well as the PLO/PA’s powerlessness to offer any meaningful help, Palestinians are forced to undertake long perilous journeys on rickety boats through the Mediterranean in search of a country that will take them. Yet, while many survive, others, who are drowning without a trace, are even less fortunate than celebrated Palestinian author Ghassan Kanafani’s fictional men who perished on similar journeys half a century ago but whose bodies remained, on a heap of rubbish, as signposts of the communal fate that lay ahead. Somewhere in a Nordic camp, a fortunate survivor is learning the layout of a new keyboard and a new city grid, starting over, alone, once again. In the boredom of waiting for residence papers, she may realize that being born in one refugee camp does not breed familiarity with another. Likewise, seniority in “refugeedom” does not yield more sympathy. Perhaps she will find that the ambiguity that long defined the relationship between Syrian Palestinians and the camp has finally been resolved: More than a prolonged shelter for an identity in danger of disappearance or cooption, the camp, or al-mukhayyam, for Syrian Palestinians is the new Safad, Al-Jish, Tiberias, and Al-Shajara. In coming to terms with its impermanence, the memories of al-mukhayyam for the second- and third-generation refugees are what the memories of Palestine were for the first. They are not a reminder of a previous place or a past life as much as they forge a fragmentary incoherent community amongst those who lost it all, yet somehow still manage to start anew anywhere they are allowed entry. Rather than enduring existential crises, Palestinians learn to deal with existence as crisis. History suggests that this is the stuff of nation building.